A lot of progress has been made at Kinder Morgan, but don't forget the past if you jump aboard here. North American midstream giant Kinder Morgan, Inc. (NYSE:KMI) has been rewarding investors with huge dividend growth, upping the payment an incredible 60% in April of 2018. It has more big hikes planned, as well. And that's not the only number that's been heading in the right direction at Kinder Morgan. It's completely reasonable that investors would be attracted to the stock, which yields a generous 4.7% today. But step back and look at the big picture before you make a final call. Here's some information that'll help you decide if Kinder Morgan is a buy. 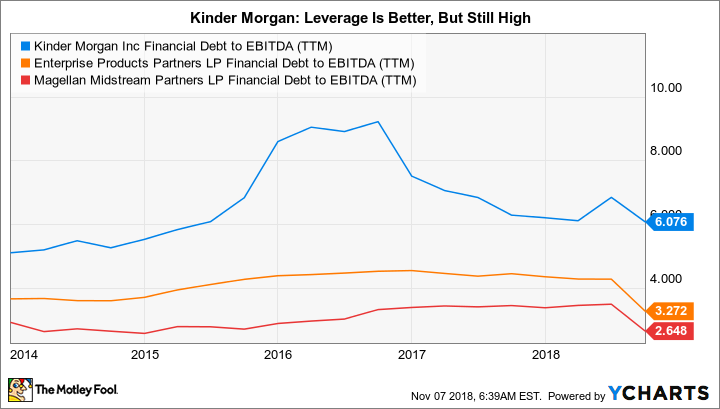 As a midstream company, one of the biggest attractions for investors at Kinder Morgan is its dividend. The yield is more than twice what you would get from an S&P 500 Index fund, and despite the huge dividend hike earlier this year, the payment is expected to head notably higher for another two years. When all is said and done, the annual payment will have gone from $0.50 a share in 2017 to $1.25 a share in 2020, more than doubling the payment in just three years. Using today's stock price, the yield in 2020 will be around 7%. That's well more than the 6.5% yield fellow midstream giant Enterprise Products Partners L.P. (NYSE:EPD) is offering today. That said, Enterprise is a more conservative entity, with lower debt levels. However, even here, you have to give Kinder Morgan some credit. Long-term debt has been reduced by nearly 17% since peaking in 2015. The pipeline company's financial debt to EBITDA ratio, meanwhile, has improved from around 9 times to roughly 6 times. Improving leverage was a promise management made a few years ago, and it is clearly living up to its word. In addition to these positives, Kinder Morgan has a long history of operating its assets quite well. It stands toe to toe with giant peers like Enterprise when it comes to industry position and the desirability of its assets, but I wouldn't buy Kinder Morgan today. If you do, you'll want to pay very close attention to the company -- this is not a "set it and forget it" investment. My big problem with Kinder Morgan stems back to 2016, when the dividend was cut a massive 75%. You might be tempted to say that's old news and the company is clearly back on track today, noting the massive dividend hikes it has planned. However, even after the dividend is up to $1.25 a share in 2020, it will still be nearly 40% below the level before the cut. More importantly, though, is that Kinder Morgan was telling investors to expect a dividend increase of as much as 10% in 2016 just a month or so before announcing that it would, instead, cut the dividend by 75%. As a company, we remain focused on our goals to continue to return cash to our shareholders in increasing amounts, to maintain our investment grade ratings and leverage targets while funding our business in the most efficient and economical way possible. Clearly, when push came to shove, Kinder Morgan didn't live up to the first part of that statement. Moreover, the close proximity of that assertion to the timing of the dividend cut should trouble income-focused investors. KMI Financial Debt to EBITDA (TTM) data by YCharts. While the company has made improvements on its balance sheet, it still remains highly leveraged relative to peers. For example, the company's financial debt-to-EBITDA ratio is much better today than it was a few years ago, but at 6 times, it is still notably higher than Enterprise's 3.3 times. In other words, the conditions that led to the dividend cut have improved but, relatively speaking, haven't changed much. Mix the lack of trust in management's assertions with the still relatively high leverage levels, and investors should clearly be cautious, here. That's not to suggest you shouldn't buy Kinder Morgan -- although I wouldn't, because trust is very important to me. If you do decide to invest here, you need to go in with your eyes wide open. Kinder Morgan has made improvements, but it needs close monitoring. For most income investors, a different midstream stock, such as Enterprise Products Partners, would likely be a better option.